There were 688 press releases posted in the last 24 hours and 154,066 in the last 365 days. 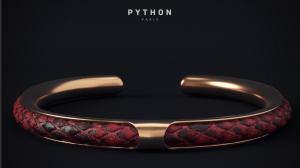 PARIS, PARIS, FRANCE, July 7, 2018 /EINPresswire.com/ -- Python Paris, an internationally renowned jewelry brand specializing in luxury exotic leather bracelets, today announced the launch of their online marketplace. The company, which prides itself on creating truly unique accessories for the fashion-forward, will sell this exotic jewelry, which includes both stingray bracelets and python bracelets, worldwide. "We are so excited for Python Paris' online launch," said Andrea De Marco, Python Paris Founder. "Each of these bracelets was inspired by the ancient cultures I encountered during my travels across the globe. Each piece hails back to our human forefathers – both in the materials used and the stories they represent. Our online store will make these fashionable accessories more accessible to our international market." With such a rich history, I also wanted to ensure that all of our products are carefully crafted from sustainable sources. True leather, which comes from ethically-raised animals farmed for this purpose, is often more sustainable and biodegradable than its faux counterpart, which is often created from plastics and polyurethane, De Marco continued. The six original styles draw from various cultures and mythologies, following the founder's passion for mythos and spirituality. Each sophisticated piece was designed to help the wearer channel power and grace. The Apollo, Shaman, Hades, and Horus are carefully crafted from python skin while Shiva and Karma contain stingray skin. Each piece exudes the characteristics of its namesake. For example, the Apollo's clean lines and simple elegance harken back to ancient Greece, from where this python bracelet draws its name. Similarly, the Horus is characterized by a simple double band and precious metal detailing. This piece also draws inspiration from ancient gods – this time from the Egyptian god of the sky. Karma, one of the stingray bracelet collections, hails from Yama, the Tibetan god of Justice. Its double bands represent the spiritual principle of cause and effect. This stingray bracelet includes precious metals and Swarovski diamonds. De Marco's designation of each of these designs was painstakingly deliberate – these ancient stories are interwoven into the exotic jewelry themselves, represented and reinforced in the luxurious materials, craftsmanship and textures of each. Each stingray and python bracelet are handmade and distinctly unique, given the inherent variety in the animal skins used. The company plans on releasing new designs in the next year. Interested fashionistas may find Python Paris products and accessories at www.pythonparis.com.